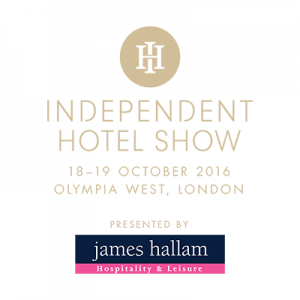 James Hallam will be sponsoring the 2016 Independent Hotel Show on 18th and 19th October 2016 at Olympia in London. Inspiring and informative, the Independent Hotel Show is the UK’s largest and best established business event in support of the luxury, boutique and independent hotel sector. A firm fixture in the calendar of independent hoteliers and industry professionals alike, the show presents a curated collection of over 300 innovative product and service providers together with expert insight from our Seminar Programme and multiple networking opportunities. Come and meet the team in the Guest Lounge or why not attend one for one of our seminars that we will be hosting during the show?